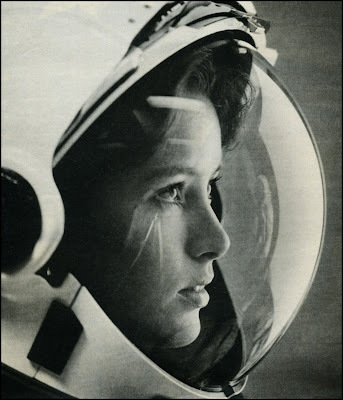 And my favorite astronaut photo, of Anna Fisher, 'reaching for the stars' after 9 days in space, back in the 1980s. I never thought I'd ever think of the 80s as being good ol' days, but there were some days then that were ok.
Credit for the photo can be found here. Love this photograph. Did you take this? Who does the credit go to? Alright, So Joe Kubert Was the Silver Age. . .